It always makes me laugh when I see an advertisement for antibacterial hand wash and house hold disinfectants to help sterilise your home. Considering that the number of microorganisms in your intestines alone is 10 times more than the total amount of cells in your body (up to approximately 100 trillion little critters), I think it’s clear to see that bacteria is here to stay. So why all the fuss to kill the “Nasty bacteria”? Well, I suspect it’s mostly clever companies marketing the fear that people need exterminate bacteria so they don’t get sick. Rather than start a discussion on conspiracy theories however, let’s look at what the science has to say and you can make up your own mind whether gut health plays a role in body composition. Research shows that gut flora can affect numerous processes in your body, including your metabolism, energy production, nutrition absorption, and genetic expression. They call the gut the second human brain and generally speaking as above is below, so if your guts is not happy, you generally feel like crap (no pun intended). The primary benefit of a healthy gut (a healthy ratio is believed to be 80% beneficial bacteria) is the extraction of energy from the fermentation of undigested carbohydrates and the subsequent absorption of short chain fatty acids, not to mention the synthesis of vitamins B + K and the metabolism of bile acids, xenobiotics and sterols like cholesterol. Two separate studies have shown that obese people have different intestinal bacteria than slim people. What’s more, the microbes (microscopic organisms) in an overweight person are much more efficient at extracting calories from food. In a study, one looking at mice and the other at humans, in both, a family of bacteria known as firmicutes were higher in the obese (20 percent more) and the bacteria called bacteroidetes were also much more abundant in leaner (the obese had almost 90 percent fewer bacteroidetes than the leaner bodies). Whilst I am not suggesting that obese people can now blame their current situation solely on “My crappy gut bacteria”, I do think there is a direct correlation between how healthy you and your immune system are (85% of your immune system is within your intestines) and your current body composition. Depending on your diet each person will have different types of bacteria to break down the foods predominantly consumed. People with a diet high in animal proteins and saturated fats will tend to colonise more bacteroidetes as they are better at breaking down these compounds. Whilst a diet rich in carbohydrates and simple sugars will attract more prevotella bacteria. Covered all the science stuff? Cool. Along with having AND FOLLOWING a professionally designed diet that is unique to only you, as well as training like a beast, what else can you do to help improve your gut flora so you have the best chance of being a fat burning machine as well as improving your health and longevity? Avoid antibiotics: Antibiotics in my opinion are vastly over utilised today. It is essentially nuclear warfare on your body and whilst you may kill most of the bad guys, you’ll also sacrifice your own soldiers as well. It can take months and even years for your bodies natural eco system to recover if at all after a course. So if you do have to take them, be sure to use a high quality probiotic (at least 50 billion spores of multiple varieties) afterwards. Avoid using disinfectants and antibacterials: Your skin is the largest absorbing organ in your entire body. You literally absorb almost anything that touches your skin, so using these often toxic substances can affect you the same way as antibiotics. I would suggest using soap, water and natural cleansers. Use fermented food: By far the best way to improve the ratio of good and bad bacteria in your gut, is to use fermented foods like raw milk kefir, yoghurts and fermented vegetables like sauerkraut. I keep a jar of chili sauerkraut in the fridge and have a tablespoon with one meal everyday. It’s easy and tastes great. 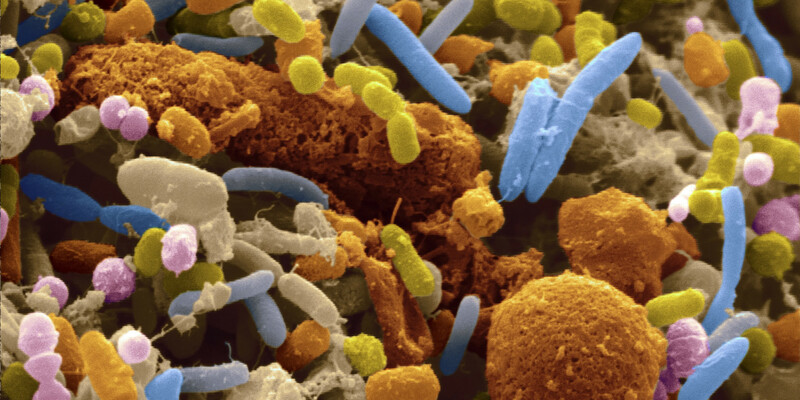 Eat more vegetables: Your gut microbes thrive on a diversity of fermentable foods aka dietary fiber. So eating a wide variety of vegetables allows a greater range of beneficial bacteria to grow and keep you healthy. This one is a no brainer! Get dirty: As I said before your skin absorbs most stuff it come in contact with, so introducing your immune system with the trillions of microorganisms on plants and in the soil will benefit your health in the long run. So get down and dirty.